What limits population size in an ecosystem? The population of a species in an ecosystem is affected by many factors such as availability of food, availability of shelter, number of predators and disease. Nearly all populations have the ability to grow exponentially. This exponential growth cannot continue forever because of the factors mentioned above. When populations reach a steady population, they are at the carrying capacity. The carrying capacity is the number of organisms that can be supported by an environment. 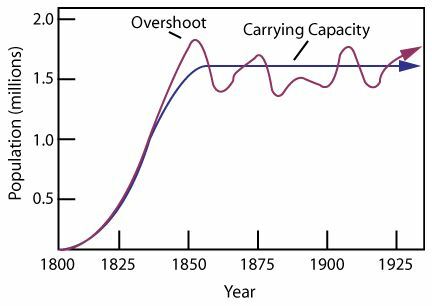 The image below shows first exponential growth (J-shaped curve), then overshoot as the population grows above the carrying capacity, and finally the population stabilizes and reaches carrying capacity where population goes up and down slightly but remains near the carrying capacity. The video below explains population growth and factors that affect carrying capacity. Age structure graphs show the portion of a population that is a certain age. Countries with a lot more young people typically grow quickly (Rapid Growth) while countries with a balance of old and young grow more slowly. Three different age structure graphs are shown below.